A dead whale has washed up at a popular California surf spot, and a boat captain says he saw another whale carcass off shore. The Orange County Register reports the first whale was spotted Sunday at Lower Trestles just south of San Clemente. Todd Mansur, who captains a whale watching boat, tells the newspaper he expects the second whale to wash up in the next few days. Each carcass is estimated at more than 40 feet long. Mansur says he inspected both whales and saw no signs of marks from ships, propeller wounds or entanglements. He says great white sharks were feeding on the carcasses. 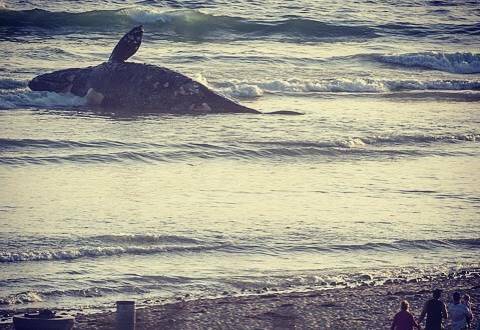 Lifeguards were not immediately available to comment, so it was unclear what would be done with the whale that washed ashore.